The ending to this cup tie was more nervy than it should have been, but all that mattered was that East Fife were in the hat for the next round come 4:45 on Saturday afternoon. 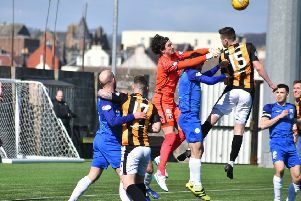 At one point in the opening half the Fifers threatened to turn the result into a cricket score as they were free-flowing in attack and battering their hosts. They grabbed two early goals, could have had at least another two or three, and appeared to be cruising. But credit to their hosts, Berwick signalled a bit of intent in the closing stages of the first half and were then vastly improved after the break. The Wee Gers started well enough and kept East Fife penned inside their own half for the opening few minutes. But with their first real attack up the park Ross Davidson handed East Fife the lead with a short range effort. It was almost 2-0 shortly afterwards but Liam Watt’s long range volley was deflected wide. East Fife were massively on top and didn’t take long in making it 2-0. Rory Currie scampered clear down the line and squared for Scott Agnew who had timed his run to perfection, slid in and beat Sean Brennan. The Fifers were well on top but couldn’t grab that crucial third goal during the first half. Currie had an excellent chance when he went one on one with Sean Brennan only to hit his shot straight at the keeper. In the closing seconds the hosts should have pulled one back when Daryl Healy found acres inside the East Fife half. But he dithered and allowed Craig McDowall the chance to race off his line and snuff the chance out. There was to be no dithering a second time though when Helay did get his name on the scoresheet. Chris Hamilton’s cross was excellent and couldn’t be collected by McDowall. Healy was first to it and powered his header past the Fife goalie. Bayview boss Darren Young said: “Overall what matters is that you’re in the hat for the the next round of the draw. “This time last year we were out which was disappointing. Berwick Rangers - Brennan, Orru, O'Kane, Wilson, Hamilton, Willis, Phillips (Hurst 77), Cook, Healy, Neill (Ogilvie 77), Brown (Murrell 72). Subs - Murray, Dowie, Happi. East Fife - McDowall, Watson , Dunlop, Meggatt, Docherty, Dunsmore, Davidson, Agnew, Currie (Dowds 65), Court (Slattery 84), Watt (Linton 77). Subs - Long, Kane, Linton, Bell, McBride.